For Gemini, logic is very important. They want the logic bound to improve before the relationship improves. Too much emotion can be hard for them for the beginning. They want to balance some things. To open a Gemini’s heart’s doors are not easy but once they open it the sensibility and delicacy they show may surprise you. Gemini people are very social. Their relationships are exciting. Most people enjoy spending time with them. They know how to be attractive and how to use this attractiveness. If you are going to be with someone from this horoscope, you should prepare yourself for mood swings. Usually they seem inaccessible, hard to get and careless. In fact, you should not mind about these things because they will be polite and fun again after a while. Gemini people love change and movement. This is why it is so hard for them to connect and they may have more than one lover. Moreover they also are very talented to hide this from the other parties. Too few of them prefer to have a quiet and calm life style. They are good life partners because they can be adapted to each kind of environment. They can be so happy with a life partner who shares the same life style with them and who cares about their needs. It is not a right thing to get married with a Gemini so fast. Before this, it is beneficial to live together for a couple years. This process is also important for Gemini people to feel ready for marriage. In this way, they find an opportunity to get to know the person who is considered as the love of their lives by Gemini people. If you are planning to get married with a Gemini woman, be ready to have a talented and hard-working wife. They want to have both a successful family and work life and they most likely to be successful. They are very attractive with their energies and positivity. For Gemini men, in the beginning everything can be tough, however once they make their decision they can be a very good husband. They are supportive, full of life and clever. They like kids and their positive approach to the life keeps them dynamic and young. Gemini people’s relationship with Air Signs is good. They share the same logic and passion. Their relationship with fire signs is also very strong. Their view of life style and energies are very similar. They can have a positive relationship. Fire Signs appreciate Gemini people’s positive approach. Their relationship with water sings is a little more complicated and difficult. They find water signs hard to understand. Cancer people are warmhearted, loving and at the same time passionate. Cancer people are very emotional and when they fall in love, they become very careful. They are so afraid of being heartbroken; this is why they are not very willing to open their heart’s doors. They want to be sure about their partner. When they start a relationship, they want it to last long. Cancer people do not act quickly, because they want to be sure that they will get a good response. This is why you can see Cancer people as passive lovers. They are domestic, especially they like eating at home and watching tv. Cancer women usually play the classical housewife role. They become happy to take care of their children and dealing with house works. They choose to use their abilities and creativity in the house. Cancer men like to fulfill their partner’s needs. Cancer people are very home-loving. They have a desperate longing for a regular relationship and family. Family is the most important thing for them in the world, they attach importance to it and try to protect. If they have a problem in their marriage, they try to solve it. Cancer sign get along well with water signs. They will be glad to satisfy each other’s needs. They are careful and kind. But at the same time they can surprise you with their passion. Their intuition and imagination are very strong. At the same time they are very polite and careful. They consider their partners’ needs and try to do the best for them. They become heart broken when the relationship is over and they experience difficulty to start a new one. Leo People are very attractive for opposite gender and they attract attention in society. They are romantic and they can easily fall in love. For the beginning in a relationship they can be suppressive for their partner and they like to do this often. This can be difficult for other parties. After a while they surrender themselves to their partner and they become a passionate lover. They want to dominate the relationship. They do not hesitate to take the first step. They are attractive and charismatic. They make their partner feel special. Leo People prefer to see only positive things in their partner. This qualification is very important to support and improve the relationship. Leo people spend their time except work with their partners. Leo people think that the world is turning around them. After a while they can see their partner as a player in their own world. For Leo people, to control is very important. For some people it does not create a problem but for the people who are give importance to their sovereignty it can create a serious problem. In fact, the person who does not let Leo dominate him/herself can be very beneficial for Leo people. Whatever the situation is, you can be sure that it will be very colorful and romantic to have a married life with a Leo. Leo women demands to be loved like crazy. They will be disappointed if they think they are being neglected. They always stand with their partner and they give support for every era starting with work life to them. They are very good mothers in addition. Leo men are a little macho. They like classical housewife type of women. Besides, they threat their wife like a queen. They do not get along well with independent women. Among fire signs, Leo people are very attractive and full of life. Although two fire signed people together can create obstinacy, they usually become good partners. Earth signs give energy to Leo people with their brilliant ideas. They provide a different point of view with details and perspective. Romantic Leo people usually attracted by water signs with their intimate passion. But there can be problems for the long-term relationships. 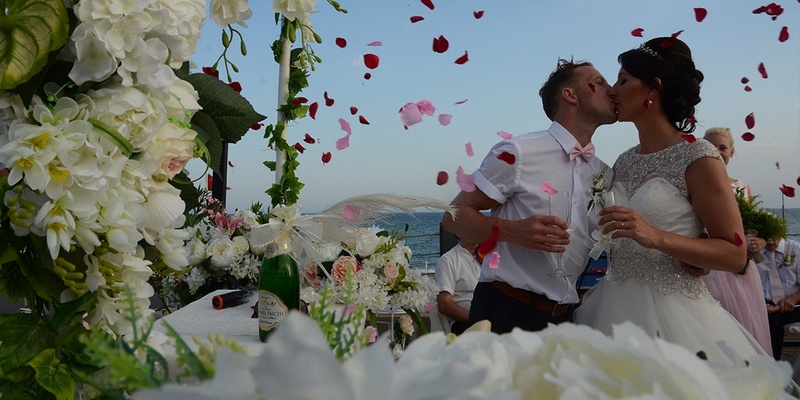 Wedding City Antalya is the best international wedding operator in Turkey. Please visit our web page to see our wedding packages.